The enslaved family. "If'n you wants to know what unhappiness means," states John Rudd, a former slave whose mother and brother were sold away, "jess'n you stand on the slave block and hear the auctioneer's voice selling you away from the folk you love." We begin with brief excerpts from the interviews of Rudd and thirty-six other former slaves, compiled in the 1930s by the Federal Writers' Project, a New Deal agency under the Works Progress Administration (WPA). They represent a wide range of experiences—family separation and reunion, voluntary and forced marriage, slaves who knew all or none of their close kin, a mother who abandoned her infant and a father who was voluntarily re-enslaved to be with his son. To return to John Rudd: "I'll say this to the whole world. Slavery was the worst curse ever visited on the people of the United States." A family history. Next we read selections from The Story of Mattie H. Jackson, written with her step-mother and published in 1866. Jackson's narrative is unusual for two features—it offers a rare multigenerational history of a slave family, and it concludes with the reunion of several separated family members after the Civil War. How does Mattie Jackson deal with the disappearance and re-appearance of members of her extended family? With whom does she live after the Civil War? Buying one's grandson. In 1841, a free "man of colour" named Cecar Pugh writes to a slaveholder in North Carolina, one of whose slaves might be his daughter. Very deferentially, Pugh asks to purchase one of her sons "to care care of me in this my decline of life." How does Pugh's letter reflect (a) a formerly enslaved man writing to a person of power and (b) a free man negotiating with another to buy a person? We do not know the outcome of Pugh's request. A family separated. Maria and Richard Perkins were an enslaved couple living on separate plantations in Virginia in 1852. A "heartsick" Maria writes her husband that her sale is imminent (a child having been sold four days earlier) and urges him to ask his master to buy her to keep a portion of her family together. We do not know the outcome of her desperate plea. How did enslaved people construct and maintain family ties on the plantation, across plantations, and at farther distances? How did the family create a "world outside of work" for the enslaved African American? How did slaves respond to the breakup of families? to losing a child or parent to a slave trader? How did family ties both provide solace and worsen grief? How does Mattie Jackson relate to her extended family of mother, step-mother, father, two step-fathers, and several siblings and half-siblings? Which relatives disappear from her life, and why? Which reappear, and why? How does she deal with the impermanent role of family in her	life before freedom? Why does she escape alone? What can be inferred about the writers' predicaments from the letters of Maria Perkins and Cecar Pugh? How would the letters be different if Maria Perkins had written her owner and Cecar Pugh had written his daughter? How does Pugh's letter reflect (a) a formerly enslaved man writing to a white person of power and (b) a free man negotiating with another to buy a person? How does he balance these opposing voices? Compile the instances in these readings in which enslaved parents try to thwart the sale of a child or accompany a sold child. What can they do? Is there a pattern to the success or failure of their attempts? How did freed African Americans try to find relatives and re-create kin relationships, especially after the Civil War? 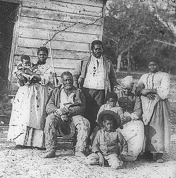 Slave family life, in Digital History, from the Gilder Lehrman Institute of American History, et al. - Woman identified only as "Mama Duck"
1 Lewis Garrard Clarke, Narrative of the Sufferings of Lewis Clarke, During a Captivity of More than Twenty-Five Years, Among the Algerines of Kentucky, One of the So Called Christian States of North America, 1845. See link above. 2 Deborah Gray White (Professor of History, Rutgers University), interview in Africans in America (WGBH/PBS), ca. 1998, at http://www.pbs.org/wgbh/aia/part4/4i3100.html. Images: "Five generations on Smith's Plantation, Beaufort, South Carolina," 1862, photograph by Timothy H. O'Sullivan (full photograph and details). Courtesy of the Library of Congress, Prints & Photographs Division, Civil War Photograph Collection.